The old art form known as commedia dell’arte appears infrequently in modern U.S. theatres. With masked, clown-like actors engaging in loud, brazen and eccentric sketches, commedia dell’arte relies heavily on lowbrow humor and audience participation to entertain, uninhibited by carefully scripted and staged material. When done well, commedia dell’arte can bring a smile to even the most serious of faces and it is a remarkably accessible theatre style for children. When I attended the Spaghetti and Meatball Player’s production of The Commedia Rapunzel, the audience was filled with the giggles of children (not to mention quite a few laughs from adults as well). 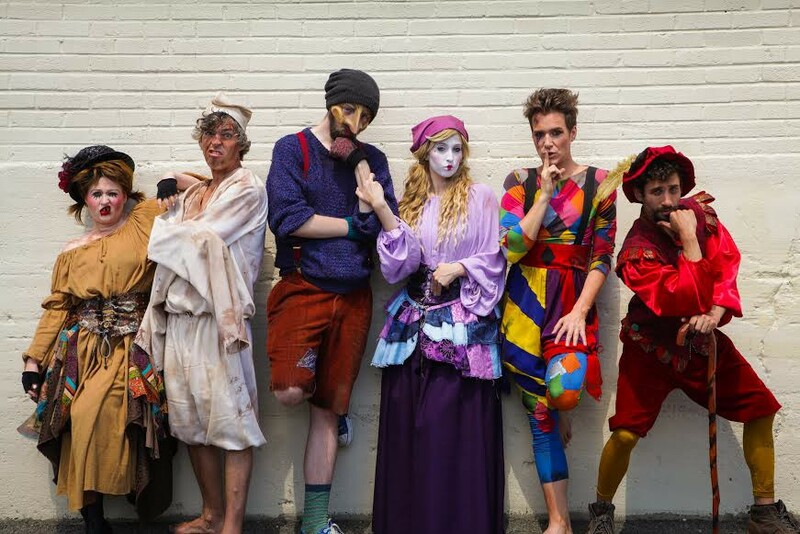 Integrating the traditional design and comedy of commedia dell’arte with modern themes celebrating individuality, and more than a few pop culture references, The Commedia Rapunzel is a riotous and fast-paced commedia show fit for audiences both young and old. The Commedia Rapunzel opens with the introduction of a traveling troupe of clowns, including all of the traditional commedia characters like the wealthy and womanizing leader Pantalone, the slapstick-loving, scene stealer Arlecchino, the ill-treated servant Zanni, the seemingly clueless (but ultimately most profound character of the play) Columbina, and the gregarious Rosetta and Pulcinella. After some audience interaction and general hijinks, the troupe sets off to tell the tale of Rapunzel. However, all is not as the Brothers Grimm intended. Rapunzel’s parents are poor country folk from Kentucky who rock Waffle House apparel and aspire to leave their small town for an adventure (with their unborn child in tow). This leads them all the way to the mythical land of New Jersey where they take up refuge in a trailer park right next to a lovely witch’s home. The couple is overcome by an irrational fear of the witch, despite her warm welcome (she brings them a plant and even offers them a discount at her vegetable stand!) After the witch catches the cobbler and his wife stealing her greens, the exasperated witch is offered the couple’s firstborn child (she was prepared to accept $5…). The witch collects her new daughter, names her Rapunzel and locks her in a tower. Rapunzel grows up in the tower talking to judgmental birds and longing for companionship, until a prince ventures by and falls in love with her. Crushed by her daughter’s new relationship, the witch cuts off Rapunzel’s hair and banishes her to a desert – leading Rapunzel to the realization that she must stand up for herself. Needless to say, this Rapunzel tale is a bit fractured. Replete with Nicole Kidman jokes, Steel Magnolias references, and plenty of musical theatre nods (e.g., an overture borrowed from Les Miserables, a rendition of 525,600 Minutes from Rent, and even a chorus line that includes ALF), The Commedia Rapunzel works very hard to entertain the children of the audience with site gags, boundless energy, and a story with an easy to grasp theme (“be weird”) while also catering to the adult patrons who can appreciate the inside jokes and pop culture references that safely sail over the children’s heads. The show’s greatest weakness involves an issue that I see over and over again – the unabashedly offensive way the show treats individuals from the Midwest and South (in this case, the cobbler and his wife who are from Kentucky). Not until I moved to NYC had I seen such social elitism manifested in artistic work, but I frequently see plays produced here that portray Midwesterners and Southerners as uneducated, conservative hicks – despite the fact that a notable portion of the population currently living in NYC hails from these regions. These stereotypical portrayals strike me as little more than a cheap laugh. Directors Sam LaFrage and Dennis Corsi demonstrate a solid understanding of the history and style of commedia dell’arte and have staged a show that incorporates limited audience interaction to great success. Aware that children do not have long attention spans, the directors bring the characters out into the audience to engage with patrons while simultaneously staging a more traditional showcase of Rapunzel. From a technical point of view, Angela Borst’s costume design is delightfully on point, using rich, vibrant colors and traditional styles and patterns to capture the spirit of commedia dell-arte on, what I am sure, was a tight budget, and scenic designers Simone Daniel and Sam LaFrage (who seemingly had a hand in nearly every aspect of this show) crafted whimsical sets that are both effective and humorous. Sam LaFrage’s name also shows up in the cast list for his portrayal of Arlecchino. LaFrage’s foppish Arlecchino is loud, self-confident, and absolutely hilarious in a wide range of roles from the cobbler’s wife to a very catty bluebird. LaFrage throws himself into his performance, and the results are quite enjoyable. However, part of LaFrage’s success with The Commedia Rapunzel is directly attributable to the ensemble as a whole. Andy Dispensa provides strong narration as Pantelone and Joe McGurl excels at physical comedy in his portrayal of Zanni. Perhaps the best actor of the group, Billie Aken-Tyers’ Rosetta is larger than life and brash, but her performance as the witch is both sympathetic and nuanced,* and Natasha Nightingale was delightful in the role of the ultra-feminine (to the point of absurdity) Columbia/Rapunzel. Joined by Conor McGuigan as Pulcinella, the entire cast complimented each other well and clearly enjoyed the farce that they were crafting on stage. In conclusion, The Commedia Rapunzel is an excellent production to attend with children, but, given the faithful recreation of many commedia dell’arte themes and styles as well as the numerous allusions to popular culture and musical theatre in the show, adults are also sure to enjoy this re-imagined romp through a beloved fairy tale. *Aken-Tyers also delivered the best line of the play. She plopped down next to me before the show and we stared at the empty stage, waiting for something to happen, until she turned to me and casually asked: “Is this a Beckett play?” Perfect.